Have you ever wondered how some of the most famous hotels in Westminster manage their waste so effectively? 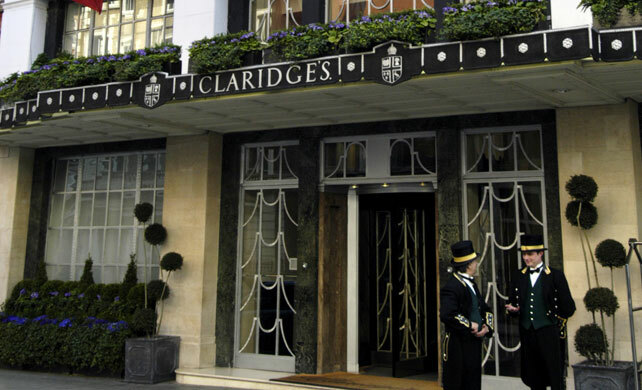 At Westminster City Council Commercial Waste Services, we work with Claridge’s to provide unrivalled waste management services, helping to protect the environment and ensure corporate social responsibility requirements are met. We have just finished writing a case study on this renowned hotel where we take a closer look at the challenges Claridge’s faced when it came to managing waste and how these were overcome. Claridge’s hotel is one of London’s most prestigious 5-star accommodations. The hotel was founded in 1812 as ‘Mivart’s Hotel’, and since 1856 Claridge’s has been known for its high-class occupants such as members of royalty, celebrities, renowned politicians and heads of state. It is also frequented by many famous actors, musicians and writers. With almost 200 rooms and over 400 staff members, the Mayfair based hotel is always full of life. What is Claridge’s approach on waste? Leading the hotel’s ‘back of house’ team of over 30 staff is Mark Golding. His team work closely with key personnel within the hotel, such as the Chef, purchasing department and the overall support team, to continuously improve the hotel’s services. Since Commercial Waste Services have been managing their rubbish and recycling Mark has seen many improvements. What requirements did Claridge’s have? Multiple waste collections per day due to limited storage space. Disposing of diverse waste types at high-performance local waste management facilities. Flexible collections due to seasonality and events when the hotel operates at full capacity. Processing large amounts of food waste from catering operations. Ad-hoc waste such as furniture, electrical items and hazardous waste. Having now worked together for 20 years, the services provided have been running very well. In the full case study, for example, we talk about the improved sorting, storage and collection process. Waste treated in the highest segments of the waste hierarchy at local high-performance waste treatment facilities, which limit the distance the waste travels. The hotel has now won the Green Apple Award and WRAP’s award for waste and environmental performance. 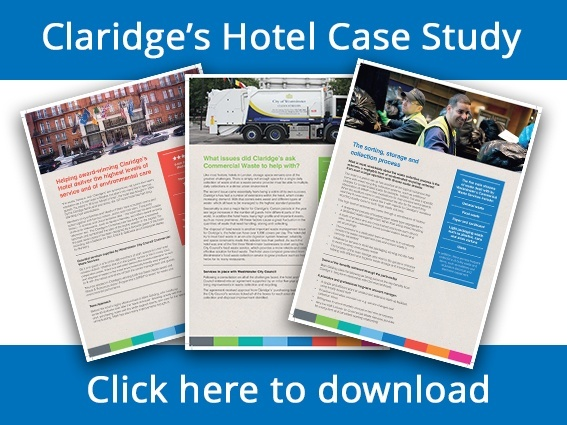 To find out more about the benefits of the Westminster City Council Commercial Waste Services and the plans Claridge’s have moving forward to further improve their waste management, download the full case study. If you’d like to look at more examples of how we provide waste management in hotels, see our growing list of case studies. Can we help you with hotel waste management in Mayfair or the rest of Westminster? Alternatively, if you would liketo learn more about our hotel waste disposal services in Westminster, click on the button below.